The vintage chronograph Heuer Autavia 1163, dates back to the golden age of car racing and was an essential instrument of a racing driver. 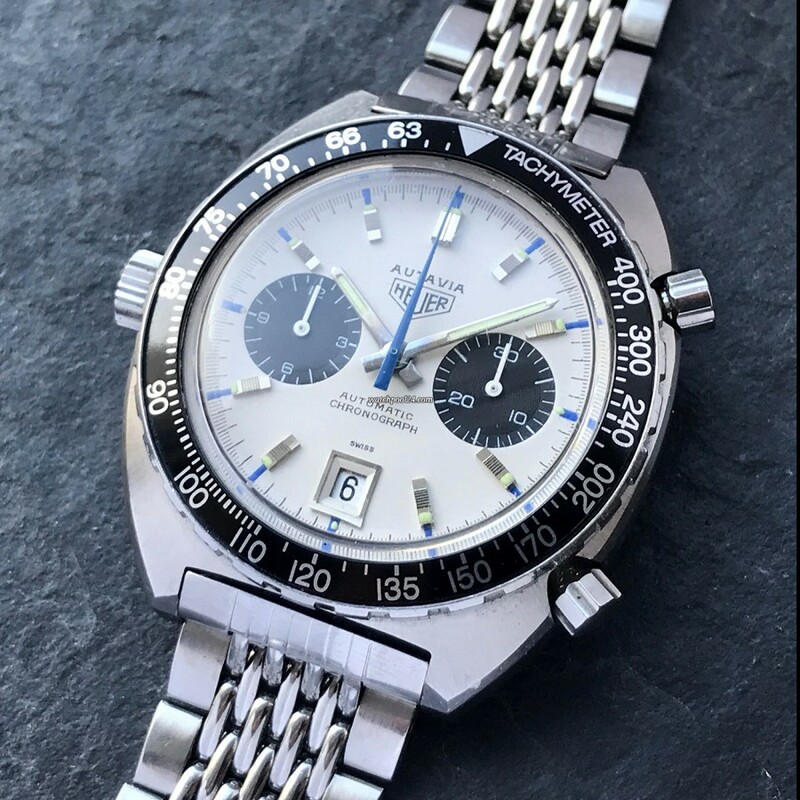 This particular variation of the reference 1163 is nicknamed Siffert-Autavia, as it was worn by the successful and famous Formula 1 racing driver Jo Siffert in the 1970s. The Siffert Autavia features a beautiful Panda dial, the date at 6 o'clock, the black tachymeter bezel and of course the legendary Caliber 11 - the first automatic chronograph movement. This particular example from 1970 is a top quality watch. Its a true rarity to find such a perfect dial like with this Autavia. The white surface, but also the black sub-dials are absolutely flawless. The luminous material is intact everywhere. Enchanting blue accents give the watch a special and unmistakable appearance. The beautiful cushion-shaped stainless steel case has natural traces of wear and shows sharp edges. The signed crown is placed at 9 o'clock as usual for the Calibre 11. The pushers are fluted. The movement has been checked and runs flawlessly. The watch comes with the wonderful Gay-Frères "beads of rice" bracelet. This Heuer Autavia 1163 Jo Siffert is a truly impressive example of a rare vintage chronograph from the 1970s.